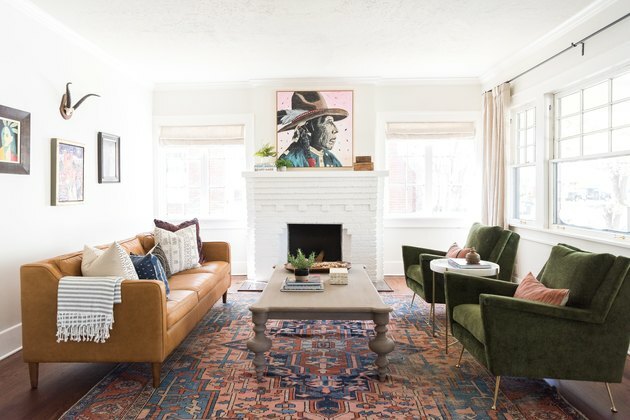 When interior designer Sheree Chamberlain was hired to transform the interiors of a 100-year-old Craftsman in Oklahoma, she used her clients' art collection as a jumping-off point. "They were drawn to saturated hues and some really psychedelic art," she says. "Finding a way to blend that style in with the grandeur of the house in a way that complemented everything instead of taking away from it was both a fun challenge and huge inspiration." Chamberlain incorporated the couple's love of bold color by sourcing vintage rugs for each room — even the bathrooms. 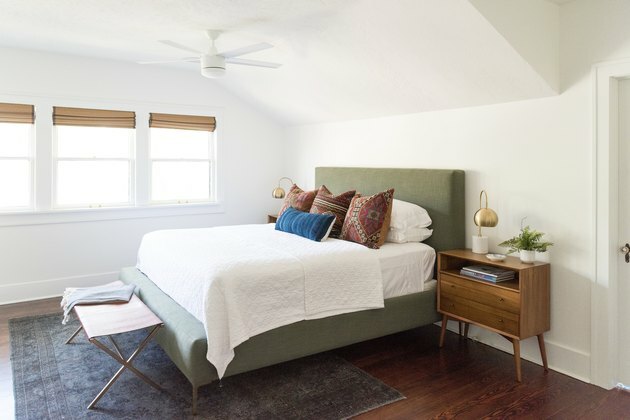 The designer wanted the home to feel collected, so she mixed pieces from West Elm and CB2 with unique items from small businesses such as Garza Marfa and Woven Abode, as well as finds from Ebay and Etsy. "Texture and organic materials were really important to me to ensure a more comfortable, laid back feeling, so we were sure to incorporate natural wood, natural stone, and leather in almost every room," Chamberlain adds. The finished home is a lively mix of art, heirlooms, and modern pieces that are as lively as the family that resides there. The painting in the living room was commissioned from local artist Ryan Cunningham. "I sent him over all of our mood boards for the furnishings, and he took it into consideration while painting a piece to reside over the mantel," explains Chamberlain. "We didn't see it until the entire room was put together and the picture was unveiled." A chandelier by Barbara Barry for Circa Lighting illuminates the Restoration Hardware table in the dining room. 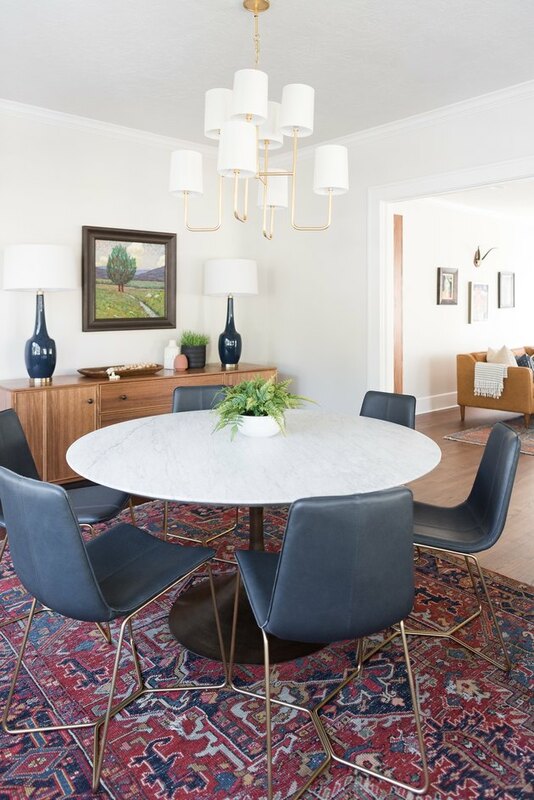 The blue hue of the West Elm dining chairs and the Lulu & Georgia lamps enhance the rug from Woven Abode. 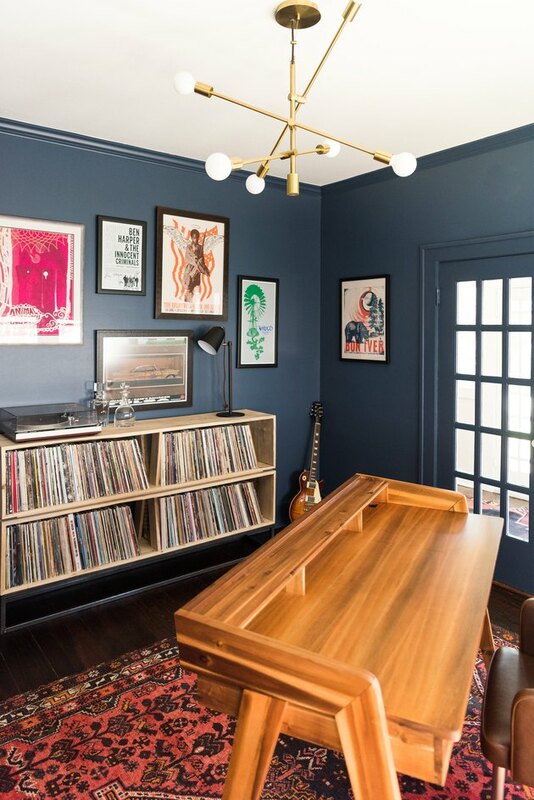 Chamberlain had a custom wall-mount shelving unit installed in the office for the couple's extensive record collection. 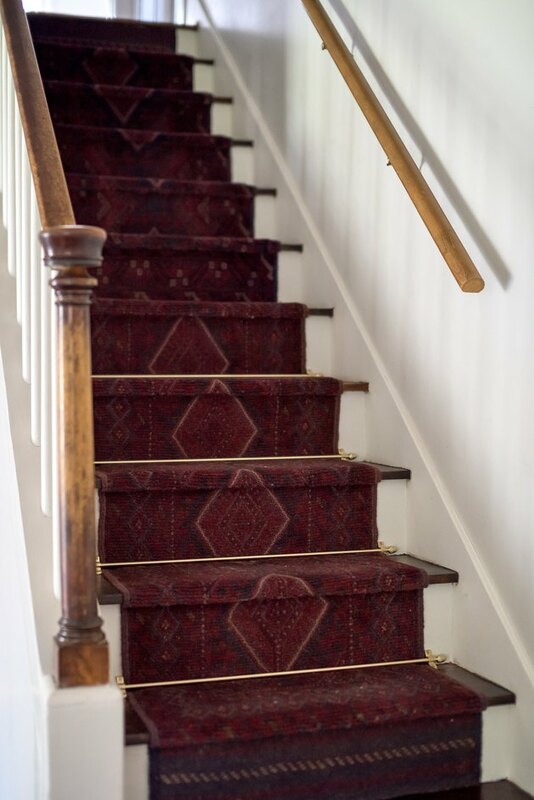 A vintage stair runner was a must-have for the clients, so Chamberlain scoured eBay for months until she eventually found two nearly identical runners that matched the exact dimensions of the stairs. The master bedroom was decorated in calming, muted tones. Vintage kilim and mud cloth pillows from Etsy top the Anthropologie bed. 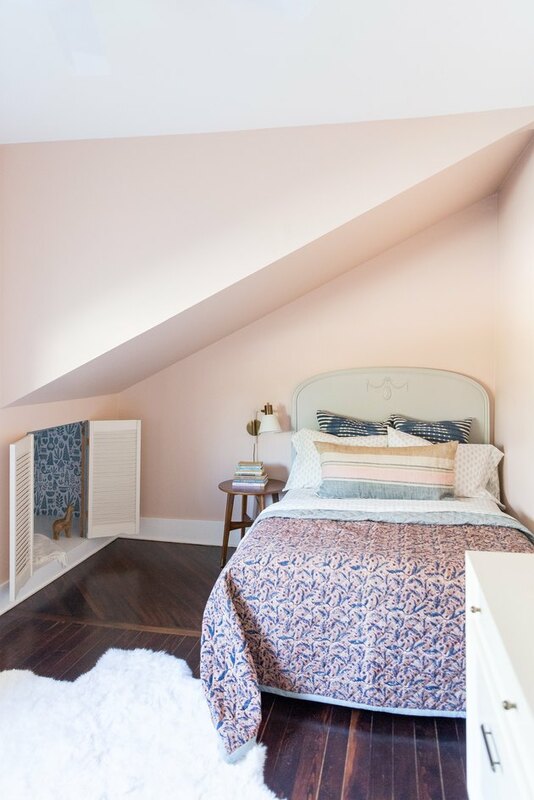 A portion of the master bedroom was converted into a spacious master bath and walk-in closet. 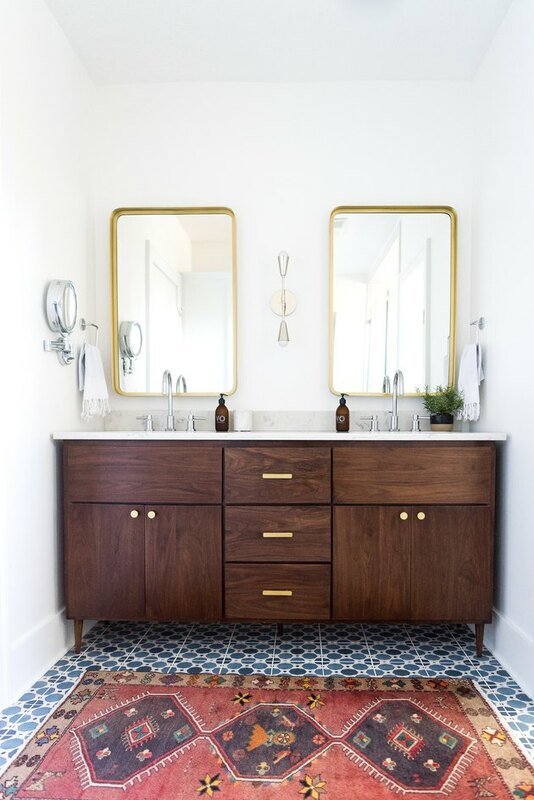 Mirrors from CB2 hang above the custom vanity and tile from Wayfair paves the floor. The headboard in their little girl's bedroom is a family heirloom, which was paired with cheery textiles from Garza Marfa and Pottery Barn. A wallpapered cubby creates a stylish spot to play. 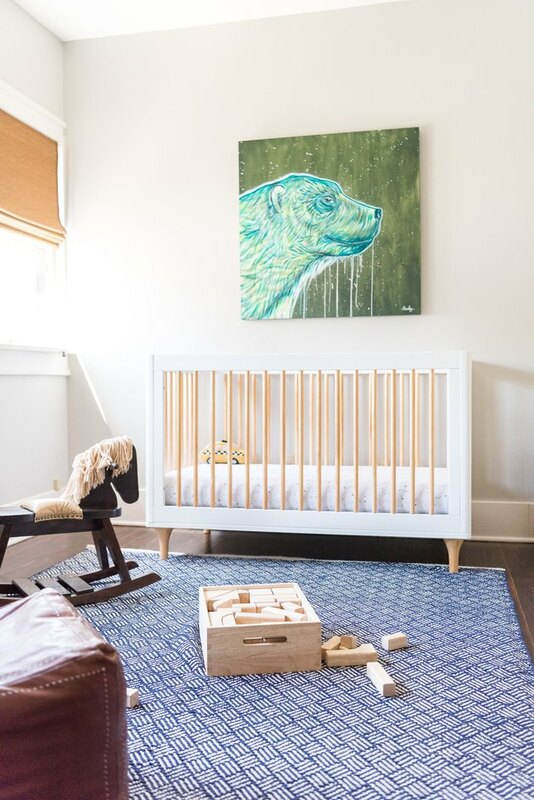 A painting by Jason Pawley and a Wayfair rug add color to their little boy's nursery. 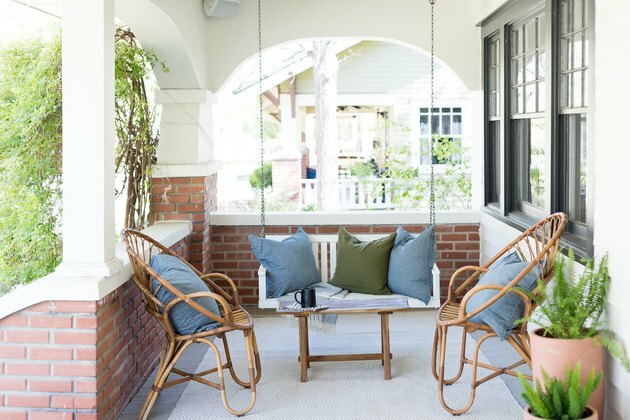 The porch swing and Serena & Lily chairs are topped with pillows from Sara Kate Studios.